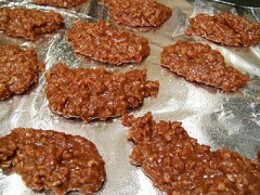 Cookies can be fun to make, especially when they are easy to make and better yet you don’t have to bake! 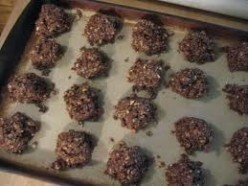 Here are three different recipes for easy to make no bake cookies. Kids loves to be your little helper in the kitchen when it comes to recipes like this so this could be a fun time for you and your little ones. Combine sugar, butter, salt and milk in a pot and bring to boil. Allow mixture to boil for one minute and add peanut butter, almond extract and vanilla and blend well. 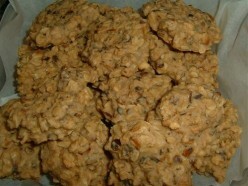 Stir in oats and use a spoon to drop the mixture onto wax paper to cool. Cocoa can be added to the sugar for a chocolaty taste. You could also add some chopped nuts or coconut when you add the oats. If you add nuts or coconut, add just a little extra milk to the mixture. Combine milk, cocoa, sugar and butter in a pan and bring to a boil. As soon as the mixture has boiled for one minute, add vanilla, coconut, peanut butter, salt and oatmeal immediately and stir until well blended. Using a spoon, drop the mixture onto waxed paper in the desired size and allow to cool. Combine cocoa, oil, salt, milk and sugar in a pan and bring to a boil. Allow the mixture to boil for 3 minutes stirring continuously and remove from heat. Add vanilla and oatmeal and mix well. Spoon mixture onto wax paper and allow to cool.